It seems like every week I'm into something new. I just learn to love so many things it is difficult not to obsesses over actual "cool" stuff all at once. These days I'm loving finding and buying unique items off of Craigslist. Who knew I would be able to own such a beautiful China cabinet, that is vintage and in an outstanding condition. Thanks to Craigslist I was able to find it and finally get to have it all for me without dealing with an actual store/shop. But anyways, thats not all. I'm also super intrigued by the idea of bringing these pieces back to life, making them over with paint, a good wipe down or reupholstering a pair of vintage round back french chairs (which I will do soon). On thursday (october 1, 2015) morning I went on craigslist with the hopes of finding something interesting and that is exactly what I found. These quite old Indian lanterns are anything but simple. Their design of vaulted ceilings is super nice plus the structure is actually stamped with what seems to be magazine cutouts. I was intrigued by the architecture plus the idea that immediately came to mind when I saw them. "Spray paint them GOLD". Did that come as a surprise to you? Below is the actual posting. As you can see, for the pair I payed $20 which I considered a fair price for such beauties. That same day in the afternoon I went to pick them up and was pleasantly surprised at how large these actually are (perfect for an impact or "show" piece). They are very well made (in India), with glass windows and considering they are over 10 years old (the lady who owned them before me said she had them for more than 10 years and only brought them out for decoration) they are incredibly sturdy. The only thing (I don't mind this too much) is that on one of them the door is broken. The ad didn't specify this detail and I only just found out about that once I had it home. No worries, though. It is totally fixable. The glass on both of these was super dirty and dusty so I right away took some time to clean them and oh boy, girl, did that make a HUGE difference. Overall I am very happy with this purchase and am so glad that I found these lanterns because they seriously look beautiful. I am not sure where they will be placed (they are large enough to put on the floor and still be noticeable or maybe on top of a cabinet or table. I don't know yet. I feel that I may definitely spray paint them gold. What do you think? (Leaving them how they are may also be a good idea. They will remain unique with their magazine stamps on). Another incredibly lucky find on craigslist were these GORGEOUS vintage french chairs (bought them October 3, 2015). I nearly swooned when I saw them come up my screen. BINGO. I found the perfect chairs for my vision. Sort of like the ones you would see in Restoration Hardware. Only that these are real and actual productions from the earlier centuries. That right there makes me all giddy inside. I love owning something that's so old and with a history. They were $160 for the pair. Quite a lot more than I wanted to spend but I couldn't pass up this opportunity. It was either buy them now or watch those beautiful vintage chairs get snatched up by a more determined DIY-er. I also payed $25 for delivery (the man whom I was dealing with wanted to charge me $50 but I insisted that I over payed for the chairs since they need so much work so he agreed to lower the shipping price for me. (A girl's gotta do what a girl's gotta do to SAVE money). Since the chairs literally arrived to me like this, with no back upholstery and the fabric on the seats undone (seems like the previous owners tried to upholster it themselves), I'll have to manage their everything. Woodwork, upholstering, maybe some paint here and there (although I doubt I'll cover up that beautiful wood with an actual golden sheen to it. In short, I will have complete say as to how they will look in the end. This chica loves that. A complete custom french chair. I've been getting so much inspiration for french chairs from the amazing blog Miss Mustard Seed and the super talented Marian, who is the author. She is an avid and experienced upholsterer among many other things like entrepreneur (she owns the brand of Miss Mustard Seed's Milk Paints and sells beautiful, real vintage items that she revives herself). Looking through all her vintage chair makeovers has reminded me that I truly enjoy do it yourself projects. This means that, I, Paola, will tackle my first upholstery project on a pair of beautiful, detail intricate french style chairs. I'm a bit nervous about the process but mainly excited about the finished product. Thanks to Marian I feel to have the right amount of knowledge and tips needed to handle this job. On her blog she has loads of great tutorials for upholstering french style chairs plus pictures showing the beauty that they become once she's done. I could spend hours (which I have) looking through those makeovers. This chica loves them, indeed. For now, while I grow the courage but mainly until I get the time to begin upholstering the chairs, I will definitely be getting the materials needed. Fabric, foam for the seats, batting, trim and everything needed to upholster the right way. This alone grows my excitement even more. Take a look at the beautiful detailing in that wood, people. Wow. Is that a bow I see? *chica swoons over the cuteness*. I think yes. Ahhh!! This is what sold me on those chairs, no doubt. The wood itself doesn't need much work. Just some really good cleaning with my trusted Murphy Oil Soap and then finally a good seal with some hemp oil or wood wax (it's in great condition considering the age). The frame too is great and super sturdy... phew, I really did not want to have to deal with the frame at all. Glass spray bottle from Rail 19. To recap, I found this beauty back on (Wednesday September 23, 2015) and immediately emailed the owners. 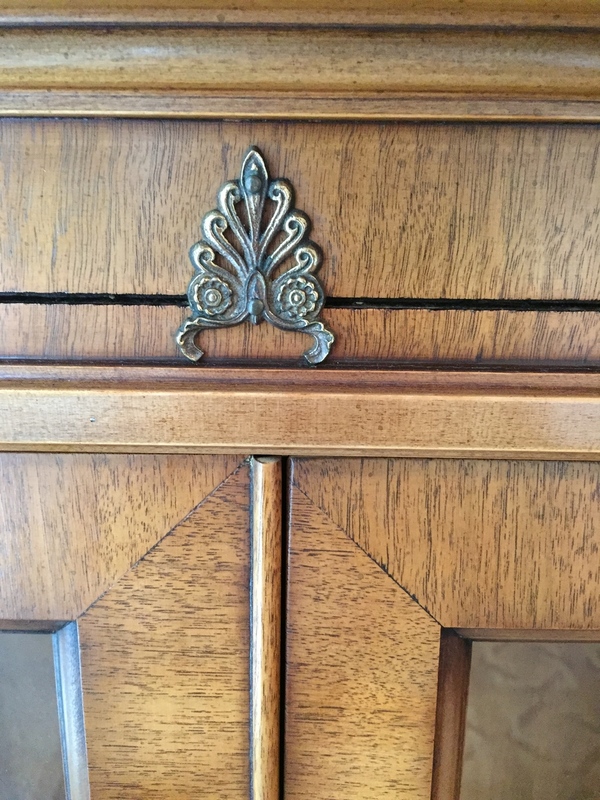 By friday the cabinet was in my home and I got it completely for FREE from the previous owners. I only had to pay a moving company $200 to bring it to me since we live a whole hour away from it and my family does not own a truck to carry this HUGE piece of furniture. $200 just to bring it home? Wow! (we need to get ourselves a truck). No biggie, it was COMPLETELY worth it. When the movers unwrapped it from the protection blanket, my jaw dropped. I couldn't believe it was MINE. The structure, wood, glass and everything in between is in excellent condition. 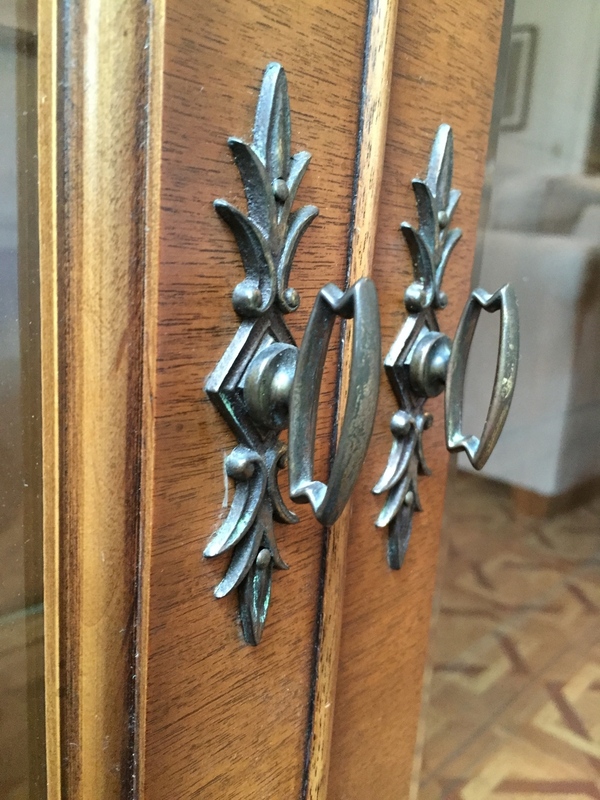 Did I mention this china cabinet is over 50 years old? Yep. It is incredible how well the previous owners managed to preserve it so well. The man I spoke to said it originally belonged to his grandmother. Can you tell from the photos how smooth the wood is? Oh my, it is incredibly buttery smooth and shiny. Seriously. I love touching it. A really cool feature are the glass side panels that allow for easy viewing inside from the sides (not pictured). Plus the moulding both at the top and bottom (pictured below). As you can see, I found awesome stuff on craigslist and hope to continue to do so. I am beyond happy and pleased with my new things and excited to put them to use. In case you're wondering, everything that I am finding on craigslist is for when I move out on my own (whenever that happens). If you haven't already noticed by reading my blog for a while, or if you're a new reader, I LOVE interior design. So I am eager to decorate my own space but of course, on a student's budget it may be difficult to buy everything new which is why I am relying on craigslist for cool, awesome, (yes, used) pieces that I can makeover if need be. Everything that I now own would have costed me way more than what I payed for them if bought new or if from a vintage shop.